A coalition of Civil Society groups have condemned the demolition of Otobo Gbame community by the Lagos State government. In a statement signed by Megan S. Chapman (Justice & Empowerment Initiatives), Okechukwu Nwanguma (Network on Police Reform in Nigeria), Betty Abah of the Centre for Children’s Health, Education, Orientation and Protection (CEE-HOPE), Ngozi Iwere (Community Life Project), Akinrolabu Samuel & Bimbo Oshobe Nigerian (Slum/Informal Settlement Federation), Yemi Adamolekun (Enough Is Enough), Maurice Fangnon of the Center for Defense of Human Rights and Democracy in Africa (CDHRDA), and Adaobi Egboka of the Legal Defense and Assistance Project (LEDAP), the coalition accused the state government of disobeying an existing court order stopping the eviction. The statement read, “We, the undersigned members of civil society, condemn the forced eviction of Otodo Gbame community on 17 March 2017 by the Lagos State Government, acting in brazen disregard for a subsisting order of court prohibiting the eviction of Otodo Gbame and other waterfronts. 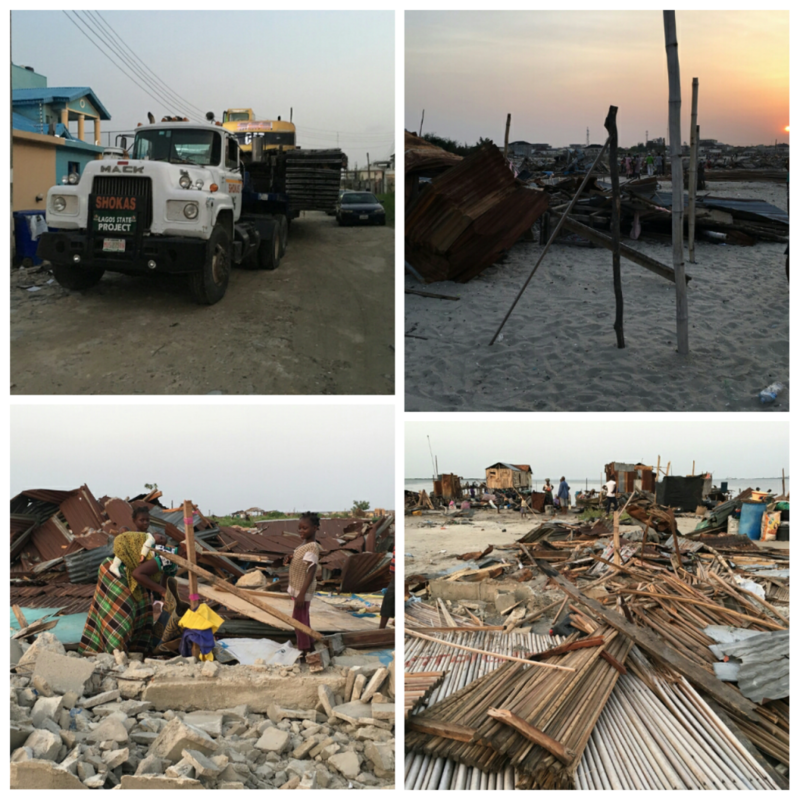 “Around 8am on Friday, 17 March 2017, residents of Otodo Gbame – an ancestral, predominantly Egun, fishing settlement in Lekki – spotted excavators and security personnel by the entrance of their community. The demolition squad, which was led by the Lagos State Task Force, accompanied by Military Police and the Nigerian Security and Civil Defense Corps (NSCDC) who said they were under orders from the Lagos State Governor and Commissioner of Environment. “Community members, and later their counsel from JEI, presented documents evidencing a court order from the Lagos State High Court enjoining the government from demolishing their community; however the demolition squad turned a deaf ear and even, with brazen impunity, informed JEI that “This is Lagos State. We don’t care about court orders; take it to the Governor.” The demolition squad presented no court order or other document authorising the demolition. “Facing an imminent threat of unlawful, forced eviction, the community members bravely attempted to form a human shield to peacefully stop the excavators from entering the community. Security forces then, reportedly, started firing tear gas and live bullets to disperse the crowd. Residents had to flee and begin scrambling to salvage what possessions they could. “The demolition squad worked throughout the day using four excavators, including a “swamp buggy” to demolish houses built on stilts above the Lagoon. Two “Black Maria” mobile detention vehicles were on site throughout the demolition as a warning against any resistance. “By early evening, all the homes and businesses built on land had been destroyed, rendering an estimated 4,698 residents – including children and the elderly – homeless in a matter of hours. The swamp buggy returned again on 21 March 2017, accompanied by more violence, to continue demolishing houses on water. There was no prior notice, no consultation, and no alternative shelter or resettlement offered. Up to date, evictees are living in fear and unthinkable conditions. “It will be recalled that the threat to the Lagos waterfronts began when Lagos State Governor Akinwunmi Ambode announced to the media on 9 October 2016 the Government’s intention to “start demolishing all shanties on waterfronts across the State within 7 days.” Based on mapping and profiling done by the Nigerian Slum/Informal Settlement Federation, at least 40 communities and over 300,000 residents were believed to be at risk of imminent eviction. “Accordingly, more than 20 Federation member communities joined together to write to Governor Ambode calling for retraction of the threat and requesting for dialogue to explore alternatives to eviction. Two peaceful protests brought thousands of waterfront residents to the gates of the Governor’s office and the State House of Assembly, but to no avail. To the contrary, the Lagos State Government proceeded to demolish Ilubirin community on 15 October 2016. Finally, the threatened waterfronts had no option but to proceed to court to enforce their fundamental rights. “On 7 November 2016, Honourable Justice S. A. Onigbanjo of the Lagos State High Court granted an injunction restraining the Lagos State Government and the Nigerian Police Force from proceeding with any demolition of the waterfronts. Despite this order, on 9-10 November 2016, Otodo Gbame community was demolished and over 30,000 residents forcibly evicted by arson attack and an excavator that began working in the dead of night while residents were sleeping. “The November demolition of Otodo Gbame has been broadly condemned as a forced eviction and a gross violation of human rights, including by the United Nations Special Rapporteur on Adequate Housing, Amnesty International, and countless others. “On 26 January 2017, Honourable Justice Onigbanjo delivered a landmark ruling in the case brought by waterfront residents, including those from Otodo Gbame. Relying on the Fundamental Rights (Enforcement Procedure) Rules, 2009. His Lordship found that demolitions on short notice without provision of alternative shelter constitute cruel, inhuman and degrading treatment in violation of the right to dignity enshrined in Section 34 of the 1999 Constitution of the Federal Republic of Nigeria and Article 5 of the African Charter on Human and Peoples’ Rights. Rather then entering final judgment, Justice Onigbanjo then ordered the parties to attempt mediation through the Lagos State Multi-Door Courthouse and ordered them to maintain the status quo – refraining from any evictions – during the pendency of the mediation and the suit. It was just a week after the waterfront communities, including Otodo Gbame, were sitting in a mediation session with the government to try to discuss alternatives to eviction that the Government came into Otodo Gbame to begin demolishing once again on 17 March 2017. “We condemn such impunity and brazen disregard for the rule of law, which is incongruous with a democratic society and Lagos’s aspiration to be a center of excellence and a world-class megacity. Lagos is a megacity by virtue of its population and it will only be a world-class megacity if it refocuses its energies on serving the needs of the people, especially the poor and vulnerable. “We are shocked by the State Government’s attempts to justify the forced eviction of nearly 4,700 people based on protection of the environment and to deny that it was violating a court order. The purpose of preserving the environment is for the wellbeing of mankind and, therefore, environmental protection measures must also respect and protect fundamental human rights. An order that parties should maintain the status quo, indeed, refers to the status quo ante bellum. Under the circumstances, the status quo ante bellum refers to the situation before the conflict began, i.e. when all the communities that fell under the Governor’s 9 October 2016 attack were still intact since this is the situation the communities sought to preserve by approaching the court.